Until the maximum is bigger than this value, no scrollbar will be drawn while autoHide to true. pathname The path to the folder that contains the images. 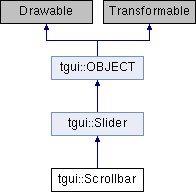 The folder must also contain an info.txt file, which will give more information about the scrollbar. Until the maximum is bigger than this value, no scrollbar will be drawn. You can however choose to always draw the scrollbar by setting autoHide to false. In e.g. a list box, this value is the amount of items that fit inside the list box. This function is overridden from Slider so that the minimum can't be changed. The minimum will always stay 0. The value has to be smaller than maximum - low value. When true (default), the scrollbar will not be drawn when the maximum is below the low value.